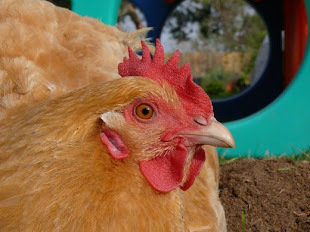 I could not find the flour tortillas that I bought for Wednesday night's dinner. Turns out they were "hiding" on the kitchen counter. 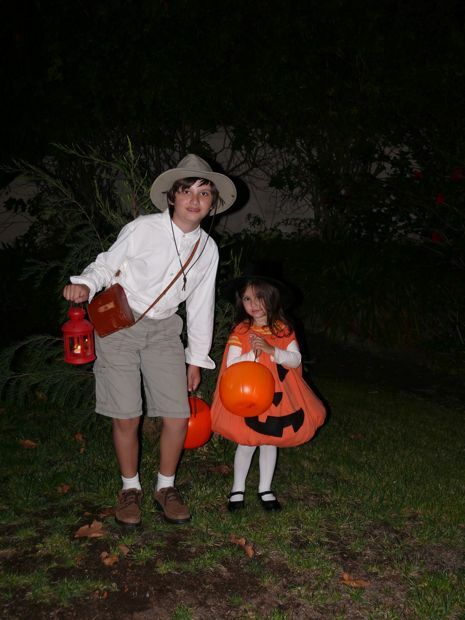 Maria wore the same pumpkin outfit I made for William's first Halloween, 17 years ago! Where does the time go?! We didn't have a fraction of the trick-or-treaters that we've had in years past. Now I am trapped in a house with 4 pounds of unclaimed chocolates! 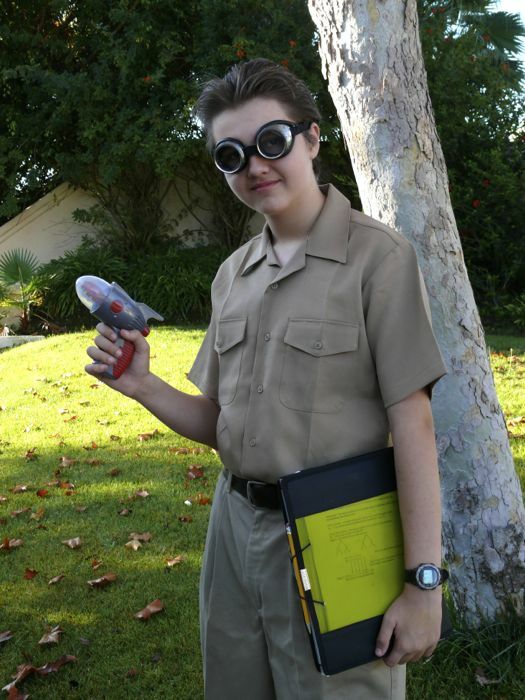 Alex dressed as Dexter from "Sky Captain and the World of Tomorrow." He planned this one for months and months. they are good judges of what I like, and I like good CG, and imaginative storytelling... like the kind you can find in a Hayao Miyazaki release. As I said before, Dexter is a good fit for Alex... those 2 inventive and morally courageous guys are a lot alike. 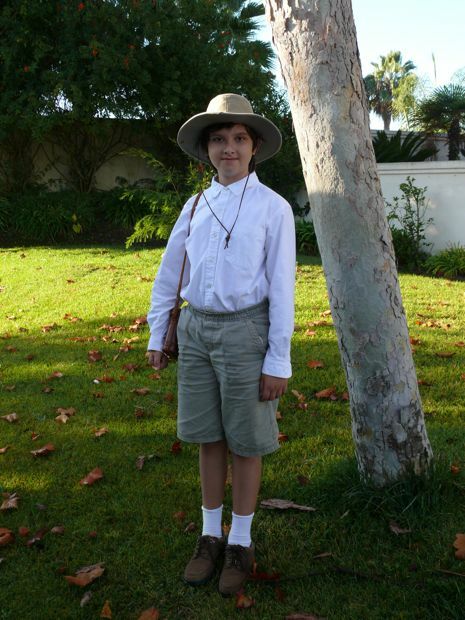 Another good match... Max as Young Indiana Jones. A scholar with adventure in his heart, eager to do what is right and be prepared for whatever comes his way! Max has been on a school break and he and I, with Maria, have been enjoying our own adventures together, like long walks, park visits, collecting pumpkins, reading "The Phantom Tollbooth," again, and having long talks about politics, elections, video games, lunch, housing. I don't know which of us will be sadder when he returns to school Monday morning. Here's our pumpkin! She never had a doubt about dressing up as a pumpkin for Halloween. We had a long day, beginning with helping at the high school's pumpkin carving contest, then pumpkin carving at home too. Before it got too late, we lit a lantern and went outside for trick-or-treating. Where does the time go? I certainly never thought we would pass 3 Halloweens in this house. 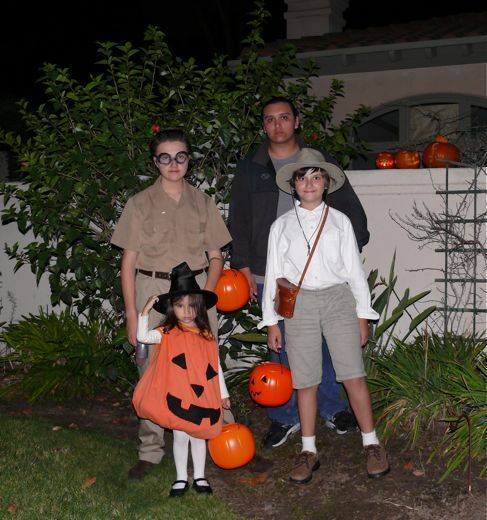 And how can William be too old to dress up and trick-or-treat... nah, I think he'll join us again next year. It wasn't about maturity or other dull hang-ups like sophistication; it was about running out of time to do a good job. Maybe we should draw up plans today, because we don't want him to skip next year. Time to swell with maternal pride. They swapped favorites and the youngest 2 exchanged dyed candies for chocolates. They shared, sorted, and waxed poetic about caramels and Smarties, about peanut butter and almonds. They let Maria double trade and trade back. They gave William good stuff and implored him to join them next year. Max confided that it wasn't quite as good without William. 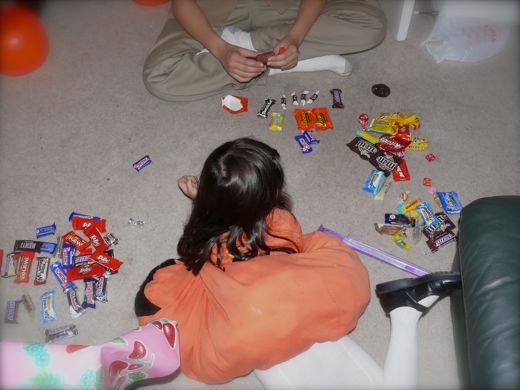 Maria spent more time re-enacting trick-or-treating in the house than she did going around our block. There is nothing scary or distressing about these children. They are a pleasure to play with, and live with, and they made this another Happy Halloween. We're Listening To: Cincinnati Pops Orchestra & Erich Kunzel, "Beware of The Blob." That's an Amazon link, but we bought the single from iTunes. 17 years for a pumpkin - what did you make it out of? LOL Did all the kids wear it when they first started Trick or Treating? I don't care how old they get, they are one good looking group of kids! Don't forget to change your clock tonight! Happy Belated Halloween! How are you? Those are some great costumes! I'm glad you all had fun. :o) And, uh, may I claim those chocolates you have left over? LOL. I won't celebrate Halloween this year. Which is sort of a bummer because here people go to the cemetery where their loved ones are buried and PAR-TAY. It gets crazy! Food, drinks, and music fill up Philippine graveyards for three days (Oct. 31 - Nov. 2)! wonderful that the handmade pumpkin costume lives on! your talents and creativity in all you do never cease to amaze!! I love your family. No wonder you are proud of them. What a great Halloween crew! I love how your kids think and plan their costumes. Though, like you, I'd be verrry afraid of that unclaimed 4lbs of candy! Your kids look so great in their costumes!!! Don't you just love Halloween? Such a cute pumpkin outfit! They are all good looking children. Such a dilemna! I will help save you from yourself. Great kids, it must be a strange day when one grows too old to T or T.
I wouldn't know cos I only experienced it once the year we were in WI in 1991 (kids of 5 -dracula and 2 - a chicken). It is a VERY big fuss about a LOT of candy. Do you remember the Young Indiana Jones TV show with Sean Patrick Flannery? I loved that show? Cute costumes! We also have about 3 lbs of super yummy candy sitting upstairs. I think we're going to put some in cute paper bags this week and "doo-bell ditch" it at the neighbors houses.